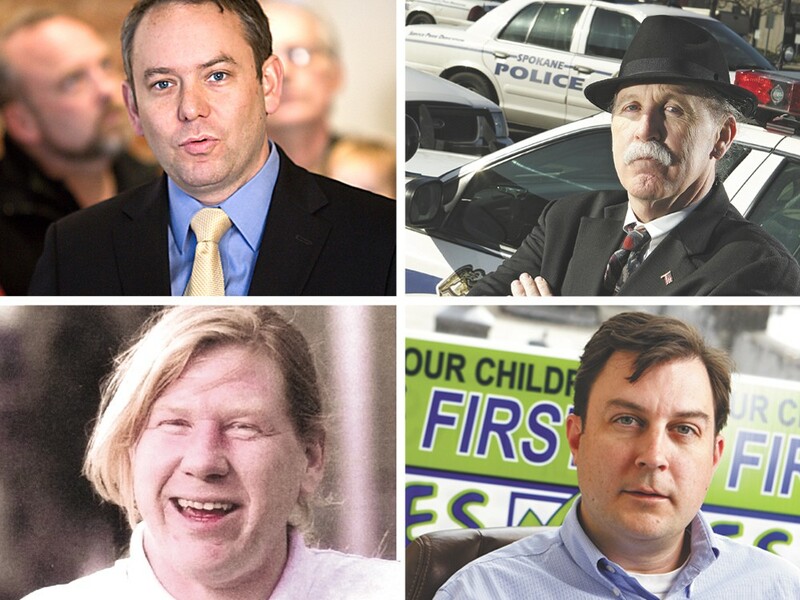 Clockwise, from top left: Mayor David Condon, Ombudsman Tim Burns, Council President Ben Stuckart and Otto Zehm. The city administration announced last week that police ombudsman Tim Burns’s tenure would be coming to an end. But as for who is going to take over for him, when that changeover will take place and what kind of power the new ombudsman will have, well, that’s up in the air. The City Council even scrambled Monday night to tweak the ombudsman ordinance to allow Burns to stay through the end of the year, but it’s unclear if Burns will actually take them up on the offer. The departure of the city’s first police ombudsman has been marked by the same atmosphere of drama and disagreement that has periodically surrounded the position during Burns’s three-year stay. The saga started with Spokane Mayor David Condon’s decision not to extend Burns’s three-year contract, which ends on Friday. Originally, the city offered to allow Burns to stay till the end of September. But City Council President Ben Stuckart says he was worried that there may be a period of time when the ombudsman’s office is empty, which he says is unacceptable. He pushed for an extension of the ombudsman’s tenure, which required changing the ordinance. The mayor backed Stuckart’s effort, and on Monday night, the council passed a provision 6-1 allowing him to stay through the end of the year. Stuckart is concerned that Burns may still end up leaving. Burns says he already made plans to leave at the end of September after last week’s announcement and is now talking to the city administrator and city attorney about when he would leave in light of the ordinance change. He says he hasn’t spoken to the mayor since the first of August. Burns says he had been worried about his job before, particularly after Condon was elected last year. He had already received two job offers (for positions he declined to name) but turned them down. “I was cautiously optimistic that if I continue to do a good job, [the city] would entertain an opportunity to continue my employment here,” Burns says. Last Week, City Administrator Theresa Sanders told Burns his contract would not be renewed, he says. Both the city and Burns pointed to the same reasons for the decision: the upcoming selection of a new police chief and release of recommendations by the city’s Use of Force Commission. On top of all that, the administration is negotiating a new contract with the Police Guild, which could include expanded investigatory powers for the ombudsman — something the office previously had, but then lost after an arbitrator ruled that the City Council had granted those powers improperly. Stuckart says he felt blindsided by the decision to send Burns packing. Condon says the opposite. Removing Burns is a step forward in his plan to improve civilian oversight of the police. Condon says he’s open to changing the position from a one-ombudsman office to a council or another type of oversight body. And he lists granting investigative powers to the office — which will be part of the new Police Guild contract currently under negotiation — as a priority. “It’s no secret out there, I’m an action guy. Let’s go,” Condon says. Liz Moore, director of the Peace and Justice League of Spokane, an organization that had advocated for the office’s establishment, says she’s concerned about the institutional knowledge Burns will take with him when he leaves. But the bigger issue, she says, is that the office doesn’t have the expanded investigative powers she believes are necessary to do the job properly. “He was obviously subject to limitations on how effective he could be,” Moore says. She also worries that the selection process for the new ombudsman, which involves a five-person council — including one member from the Police Guild and another from the Captains and Lieutenants Association — gives undue influence to the unions. “It just doesn’t make sense for the Guild to be picking the people who are overseeing them. It just doesn’t work that way,” Moore says. Stuckart says he’s considering further changes to the ombudsman ordinance, including putting the office under the supervision of the City Council. As for what’s next, the 59-year-old says that’s yet to be decided.